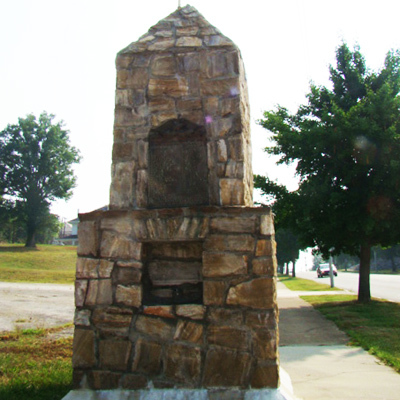 The Wilkes County Memorial Avenue Monument stands about fourteen feet tall on a sidewalk corner at the intersection of D Street and Ninth Street (Memorial Avenue). This stone marker has a large rectangular base, with an obelisk shape making up the top portion of the monument. The original bronze plaque on the top portion of the monument faces Ninth Street (Memorial Avenue), with a list of fifty-one Wilkes County veterans who gave their lives in World War I. A second plaque was later added in 2000 to the opposite face of the monument, with a corrected list of fifty-five names of Wilkes County World War I veterans. Front, 2000 plaque: ON NOVEMBER 11, 2000 THIS CORRECTED / PLAQUE WAS REDEDICATED / Left column of 2000 plaque: ADAMS, GEORGE F. / ANDERSON, CLINTON A. / ANDERSON, ELBERT / BARNETT, DANIEL G. / BOWERS, A. BURR / BROOKS, BOSS / BROWN, JOHN / BYRD, ERNEST / BYRD, ROBERT / CHURCH, PHILLIP P. / CLANTON, JOSEPH J. / CLANTON, RICHARD M. / COMBS, EDGAR / COTHREN, CHARLES W. / CRYSEL, JAMES W. / DAMERON, JOHN C. / DANCY, ISSAC P. / EMERSON, JAMES F. / FERGUSON, JAMES E. / FERGUSON, ROBY / FOSTER, ALBERT F. / GOULD, FELIX C. / GRAY, JAMES S. / HACKETT, ROBERT / HAMBY, THOMAS E. / HARRINGTON, EUGENE / HODGE, JAMES H. / HOLDER, JAMES A. Right column of 2000 plaque: HOWELL, CHARLES H. / HUIE, TYRA V. / JAMES, T. JOE / JOINES, MAC / JOINES, TALMADGE / JOHNSON, GERMAN L. / JOHNSON, RICHARD L. / KENDALL, JEAN / LOWMAN, ESTILL C. / MARTIN, OGBURN D. / MILLER, GAITHER / PEARSON, D. STOKES / PEARSON, WILLIAM Z. / POPLIN, WILLIAM B. / RHOADES, ALEXANDER / SAUNDERS, ROWAN D. / SUMMERLIN, ZOLLIE A. / TRIPLETT, JULIAN C. / TRIPLETT, SILAS / WALKER, CHARLES C. / WALKER, WILLIAM H. / WALKER, WILLIAM T. / WALSH, THOMAS I. / WATKINS, CLYDE E. / WELBORN, GEORGE / WILCOX, WILLIAM M. / WILLIAMS, ROBERT F.
The North Wilkesboro Civic League erected the monument on November 11, 1920 during the dedication of Memorial Avenue, previously called Ninth Street. The dedication took place at the Presbyterian church, in honor of fifty-five Wilkes County men who died during World War I. During the ceremony, the Civic League and the ex-service men marched together into the church and were given seats of honor. Children from the North Wilkesboro grade school sang numerous hymns leading up to the service. The program included songs, a scripture reading from Reverend W. F. Staley, prayer led by Dr. W.R. Ware, and a reading of the names of those who died in service. The Civic League and local Red Cross Chapter provided lunch to the ex-service men at the program. As part of the dedication, one maple tree was planted for each of the fifty-five soldiers. During reconstruction of the monument, a new foundation was built and an updated plaque was added with corrected names of soldiers. The marker stands on a corner at the intersection of Ninth Street (Memorial Avenue) and D Street. The monument is positioned at a sidewalk intersection, surrounded by a grassy landscape and maple trees lining the sidewalks. There is an open parking lot behind the monument in a large area of grass. An annual Veterans Day Service is held in the parking lot next to the Memorial Avenue marker, organized by the Memorial Avenue Tree Committee. During the annual service, there is typically a keynote speaker, a roll call of all Wilkes veterans from WWI to present, a gun salute, and the laying of wreaths on the street corner at the monument.